InventoryEdge is designed to track consumable goods and tools. Once you have entered these items into your account, you will be able to streamline the process of requesting, ordering, and tracking supplies and tools. Required fields are indicated by a red check box . 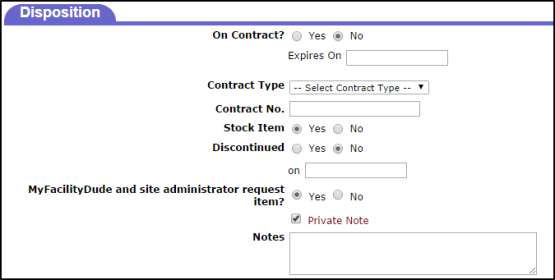 If you would like requesters and site administrators to be able to request this item, select Yes next to MyFacilityDude and site administrator request item? Enter a Tolerance Level % for this item. This percentage is based on the high level reorder amount that you set for this item. It determines how much inventory you can issue from each pool when the on hand quantity of the item in that pool is zero. If you leave this field blank or enter a zero, you will not be able to issue inventory when there are no items in the pool. When entering a new inventory item, Dude Solutions recommends that you enter a zero (0) for the Beginning Balance to start out. 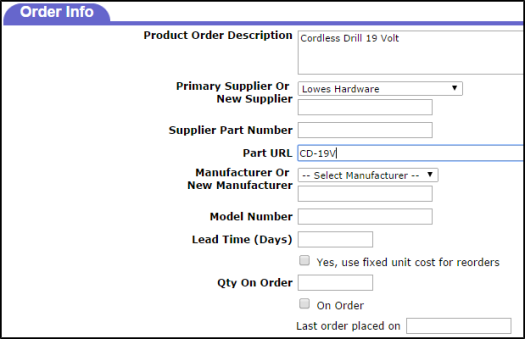 Once you have done a physical count of your inventory and are ready to start using the system, you can enter Adjustment transactions through the clerk form to correct the on hand balance. This saves you from having to count your inventory multiple times before you are ready to implement InventoryEdge as your quantities will change as you set up the account.